вЂў Do not quick-charge a battery unless the battery ground cable has been disconnected, otherwise you will damage the alternator diodes. вЂў Do not attempt to crank the engine with the battery ground cable loosely connected or you will severely damage the wiring. вЂў Make sure the connectors are clean and have no loose wire terminals. вЂў Make sure multiple cavity connectors are packed with dielectric grease (except watertight connectors). вЂў All connectors have push-down release type locks (A). вЂў Some connectors have a clip on their side used to attach them to a mount bracket on the body or on another component. This clip has a pull type lock. вЂў Some mounted connectors cannot be disconnected unless you first release the lock and remove the connector from its mount bracket (A). вЂў Never try to disconnect connectors by pulling on their wires; pull on the connector halves instead. вЂў Always reinstall plastic covers. вЂў Before connecting connectors, make sure the terminals (A) are in place and not bent. вЂў Check for loose retainers (A) and rubber seals (B). вЂў Insert the connector all the way and make sure it is securely locked. вЂў Position wires so that the open end of the cover faces down. 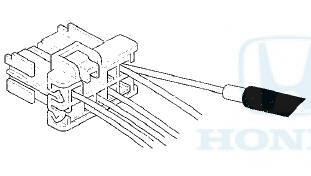 вЂў Secure wires and wire harnesses to the frame with their respective wire ties at the designated locations. вЂў Remove clips carefully; don't damage their locks (A). вЂў After installing harness clips, make sure the harness doesn't interfere with any moving parts. вЂў Keep wire harnesses away from exhaust components and other hot parts, from sharp edges of brackets and holes, and from exposed screws and bolts. вЂў Seat grommets in their grooves properly (A). Do not leave grommets distorted (B). вЂў Do not use wires or harnesses with broken insulation. Replace them or repair them by wrapping the break with electrical tape or shrink tubing. вЂў Never attempt to modify, splice, or repair SRS wiring. If there is an open or damage is SRS wiring or terminals, replace the harness. вЂў After installing parts, make sure that no wires are pinched under them. вЂў When using electrical test equipment, follow the manufacturer's instructions and those described in this manual. вЂўIf possible, insert the probe of the tester from the wire side (except waterproof connector). вЂў Use back probe adapter, 17 mm 07TAZ-001020A. 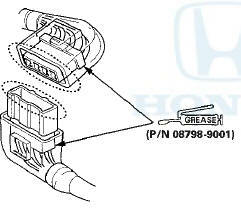 вЂў Refer to the instructions in the Honda Terminal Kit for identification and replacement of connector terminals. 1. Verify The Complaint: Turn on all the components in the problem circuit to verify the customer complaint. Note the symptoms. Do not begin disassembly or testing until you have narrowed down the problem area. 2. Analyze The Schematic: Look up the schematic for the problem circuit. Determine how the circuit is supposed to work by tracing the current paths from the power feed through the circuit components to ground. If several circuits fail at the same time, the fuse or a ground is a likely cause. 3. Isolate The Problem By Testing The Circuit: Make circuit tests to check the diagnosis you made in step 2. Keep in mind that a logical, simple procedure is the key to efficient troubleshooting. Test for the most likely cause of failure first. Try to make tests at points that are easily accessible. 4. Fix The Problem: Once the specific problem is identified, make the repair. Be sure to use proper tools and safe procedures. 5. Make Sure The Circuit Works: Turn on all components in the repaired circuit in all modes to make sure you've fixed the entire problem. If the problem was a blown fuse, be sure to test all of the circuits on the fuse. Make sure no new problems turn up and the original problem does not recur. 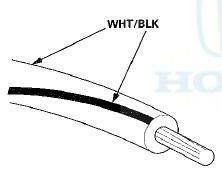 The wire insulation has one color or one color with another color stripe. The second color is the stripe. NOTE: For specific operations, refer to the user's manual that came with the Honda Diagnostic System (HDS). Make sure the HDS is loaded with the latest software. 1. Connect the HDS to the data link connector (DLC) (A) located under the driver's side of the dashboard. 3. Make sure the HDS communicates with the vehicle; if it does not troubleshoot the DLC circuit (see page 11-181). 4. Enter the BODY ELECTRICAL then select the desired MODE MENU. 5. Check for DTCs with the HDS. NOTE: If the DTCs do not pertain to the selected menu, select the All DTC Check icon to view all Body Electrical DTCs. 6. If any DTCs are indicated, note them, and go to the indicated DTC troubleshooting.